The Alberta government is ensuring victims of crime have the help they need with a five-point plan that will strengthen support for victims. Minister Ganley announces additional funding to support victims of crime with Supt. Darren Leggatt, Calgary Police Service, Brian Turpin and Alf Rudd, Alberta Police Based Victim Services Association. An additional $4.5 million in available money from the Victims of Crime Fund will improve the scope and quality of programs for victims of crime in five key areas. The increase in available funding will go towards police-based victim services units, support for domestic violence survivors, help for victims in court, restorative justice initiatives and expanding outreach services for Indigenous victims. Victim service units work across Alberta supporting victims of crime during police investigations and throughout the criminal justice process. 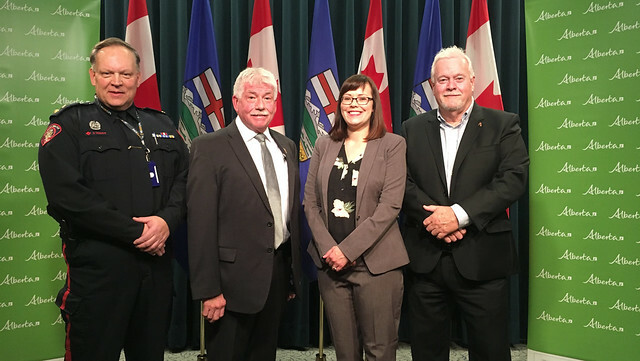 Available funding will nearly double for police-based victim services units in seven municipalities – Edmonton, Calgary, the Regional Municipality of Wood Buffalo, Red Deer, Grande Prairie, Lethbridge and Medicine Hat. Additional money will ensure high demand programs in Edmonton, Calgary, Red Deer, Grande Prairie, Lethbridge, Medicine Hat and the Regional Municipality of Wood Buffalo can continue helping Albertans, and enable these assistance teams to provide support to surrounding areas. Preventing and addressing family violence is a high priority, and additional funds will be used to enhance province-wide services that address the complex needs of survivors of domestic violence. More information about these initiatives will be available in the coming months. Dedicated staff and the purchase and upgrade of testimonial aids, such as screens and closed-circuit television upgrades, in courtrooms across the province will help ensure vulnerable victims and witnesses are able to participate in court processes, provide testimony and navigate the justice system with more confidence. Expanding the existing Indigenous Victims Outreach Services program into more communities will increase access to support for Indigenous victims of crime in both urban and rural settings. An increase in grant funding available will help support restorative justice initiatives in communities across the province. Funding for police-based victim services units in Edmonton and Calgary will increase from $300,000 to $500,000 each in 2018-19 and to $600,000 for the next three fiscal years. Funding for police-based victim services units in Red Deer, Grande Prairie, Lethbridge and Medicine Hat will double from $150,000 to $300,000 each in 2018-19 and the next three fiscal years. Grant funding for the police-based victim services unit in the Regional Municipality of Wood Buffalo was quickly increased to help victims after the Wood Buffalo Region wildfire in 2016. Available funding for the area will increase from $265,000 to $300,000 in 2018-19 and the next three fiscal years.